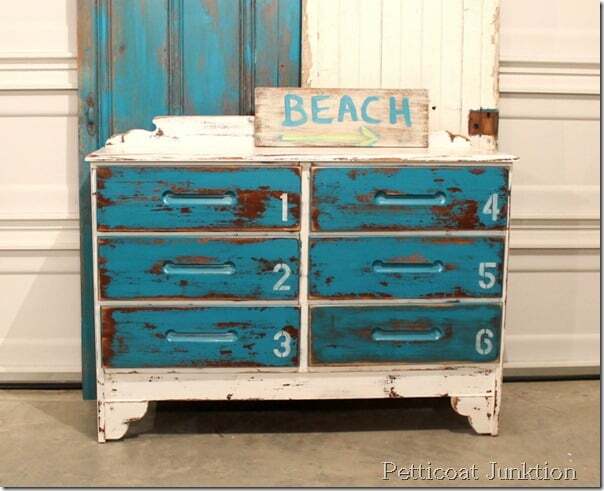 Beach inspired dresser in blue and white with stenciled numbers. What do you think about this little blue and white number (no pun intended). Numbers and letters seem to be the latest decorating rage and I couldn’t wait to jump on the band wagon. 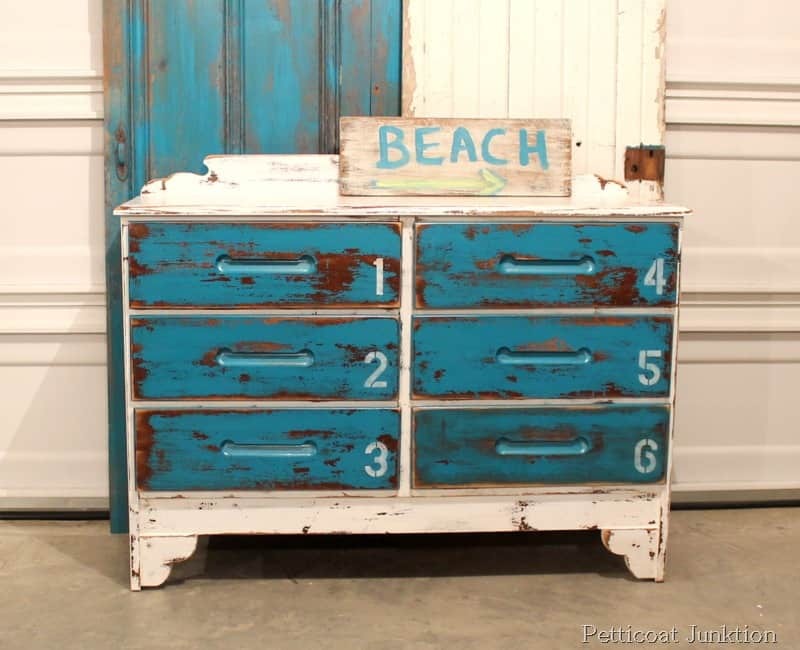 I purchased this beat-up dresser at the Nashville Flea Market and it was a perfect candidate for the beachy numbered look. 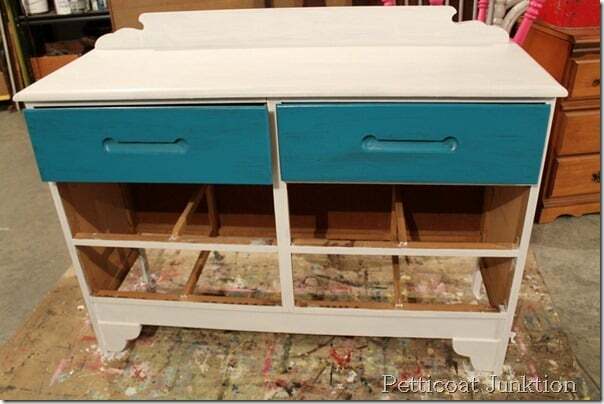 I painted the casing in a satin white and the drawers are a custom mix from Home Depot. The look in this photo is not what I was going for. I wanted it very heavily distressed and worn looking. After I distressed all that beautiful paint. That’s the look I’m going for. 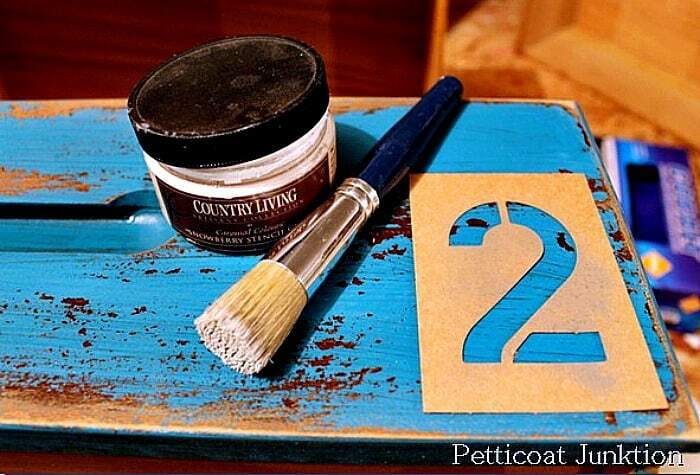 I used white stencil crème, a stencil brush, and simple block number stencils. I do have some words of wisdom to share. Make sure you have your drawer sitting right side up before you paint the number on. You don’t want the number to be on the wrong side of the drawer and upside down. It will take a while to correct if you mess it up…..says the voice of experience. All put together and looking beachy. The Beach sign is just a little something I whipped up! You can find the tutorial for this sign and more beach signs featuring crabs and lobsters here. Anyone else headed to the beach this summer? 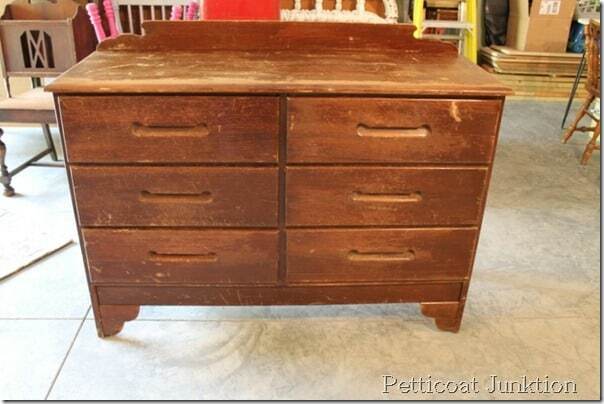 I LOVE this little dresser Kathy. Great job. I would also love to know the name of the paint if you can find it. Now did you also distress this using your power sander? Thanks. OMG! I absolutely adore this piece! Fantastic transformation. 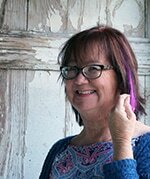 This piece is soooo cute, Kathy! You did a great job! I’ll look on the can in the workshop and get the code if I haven’t dripped paint on it. That’s really cool, I want it! I don’t think it would go in my house, but whatever that is just so awesome! Wow – this is really gorgeous! I love the transformation and the numbered stencil. 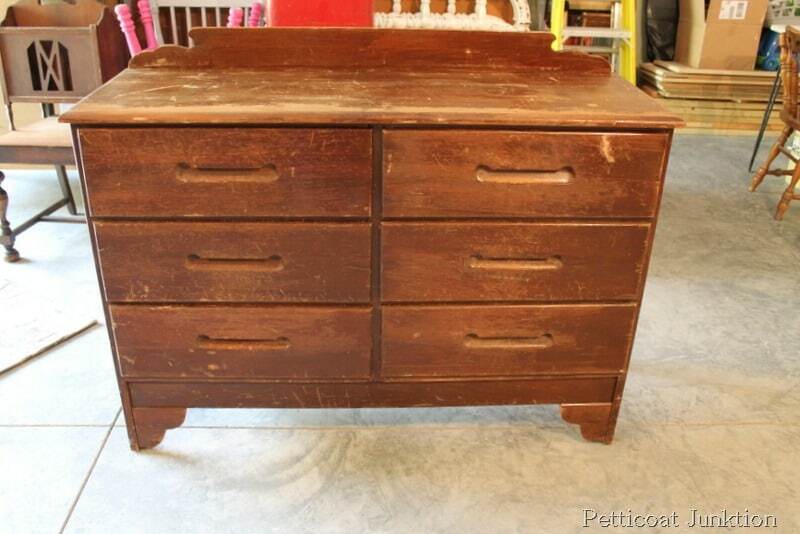 I’m searching the web right now for inspiration on a dresser I’m about to start on. I’m so excited ! That’s lovely Kathy! Wonderful job! Wow! That came out gorgeous! Definitely a piece I’d love to have in my home!! what a great fun piece. I love your color choices. featuring on my weekly wow’s on Saturday. Bravo! 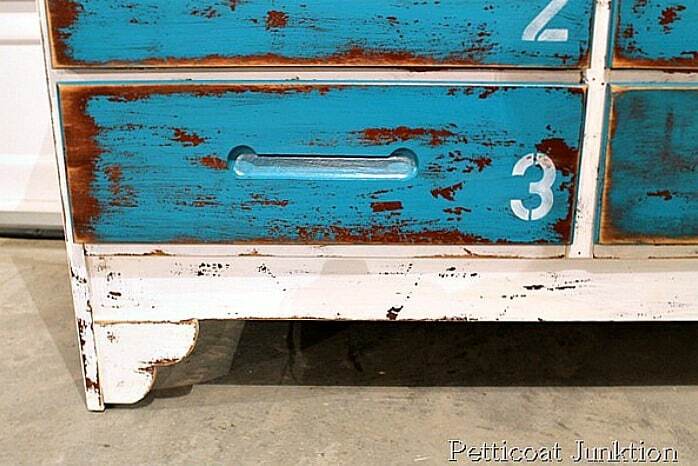 I love the colors you used, the heavily distressed, worn look is something I really want to try. Beautiful! this is so cool. you did an amazing job with the colors, the finish, EVERYTHING! Oh my Goodness! This is stunning! I saw it shared on FB and had to come by and tell you what a fantastic job you’ve done refinishing. So very pretty! Love it! and would you believe I made almost the identical beach sign this week? You’ve inspired me Kathy! 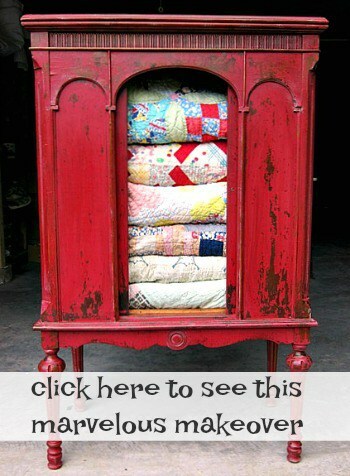 I have some old dressers that need some updating, they have a weathered look that is not intentional, ahem, just neglected! Yours looks great! Thanks! I love it – the contrast with the dark wood, deep blue and bright white is great. And you can never go wrong with numbers. Fantastic job! 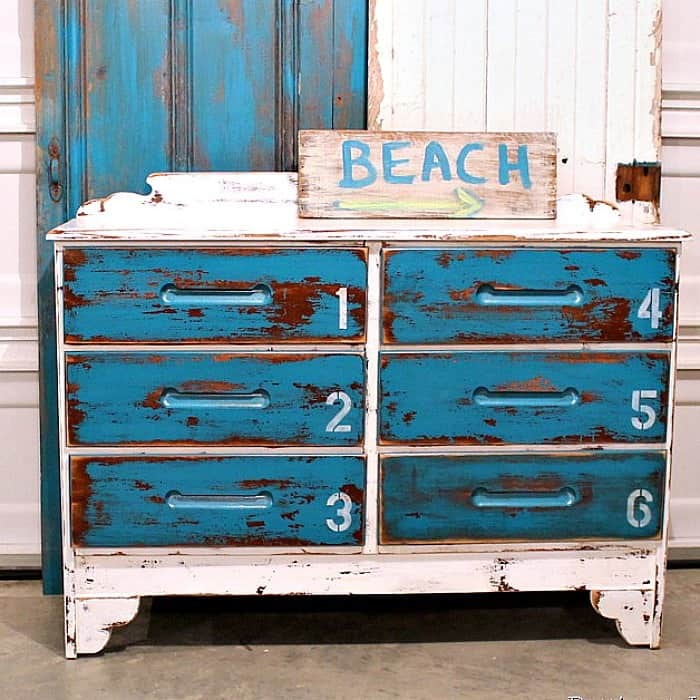 Love this fun rustic look! So much cuter now! Love it. I want to try the number thing too but haven’t found the right piece to try yet. How cool is that dresser!!! 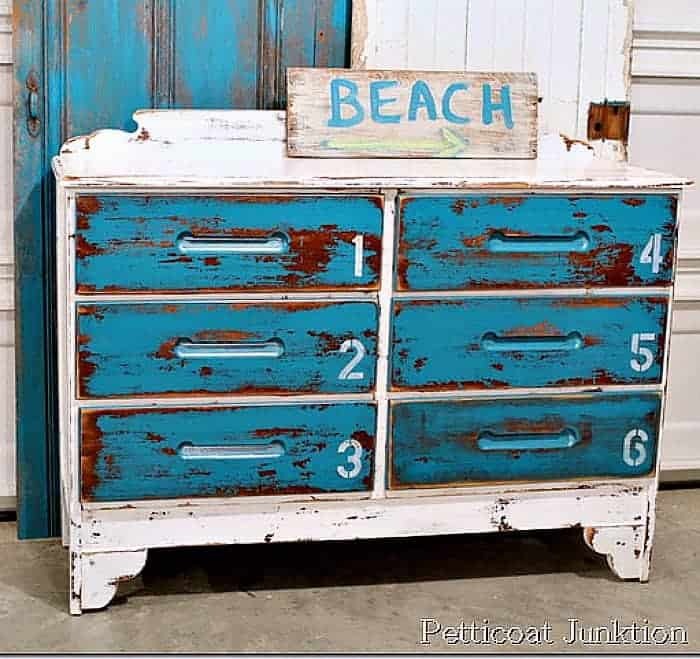 Great job, so unique and perfect for a cottage or theme beach room. Love it! I haven’t been to the beach in ages. Sigh. I love the transformation. I would have walked on by this dresser. I love turquoise and yellow. Keep those colors coming. We were in Franklin, TN for their festival over the weekend. I wanted to stop in the Nashville Flea Market on the way home but have no idea where to find it. Can you give me directions. I am from St Louis area. Would also love to drop In and shop at your place. Had the small car though so couldn’t buy furniture this time. I did purchase a rusty garden gate in a store in Franklin. It is looking for a spot in my garden.